Introducing Beautiful Autumn Leaves' Spot, Koyo in Osaka. Autumn Leaves is one of the best scenic beauty in Fall in Japan. Osaka has many temples that has beautiful Maples. That is the feature of Osaka Koyo. Koyo at Katsuo-ji (勝尾寺の紅葉) is also known as the one of the most beautiful Autumn leave in Osaka Prefecture. Katsuoji has a beautiful pond surrounding gardent that has a breathtaking view of entire temple with many beautiful Koyo Trees, such as Japanese Maples. Around the end of November, it has breathtaking Autumn leaves. 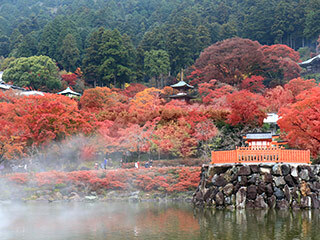 The contrast of flaming color of Koyo and green of the forest is stunning. Admission: 400 JPY for adult, 300 JPY for under Junior. Season: Around the end of November. 0. at Senju Chuo Station. 1. use Local Bus to Katsuoji Temple.